Acer has stolen a march on the barrage of tech announcments due at next week's CES show by revealing two new updated tablets, a new smartphone and a refreshed Chromebook. Acer will showcase updated versions of its Iconia A1, Iconia B1 and C720p touchscreen Chromebook at CES next week, the company has announced. It will also introduce the new Liquid Z5 smartphone - a 5-inch budget Android blower that will launch in mid-January. 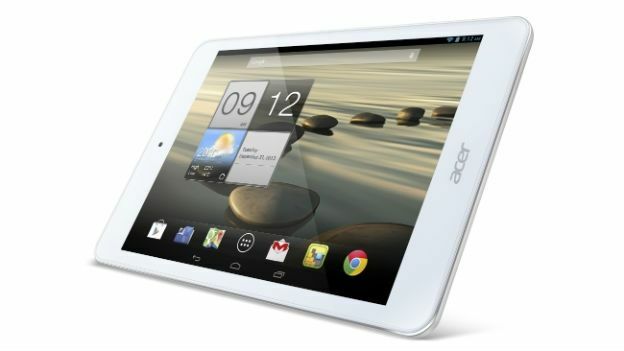 The headline act of Acer's new lineup is the updated Iconia A1-830 tablet (pictured above) that features a 7.9-inch 1024x768 screen inside an aluminium chassis. With an asking price of €169 (£140), Acer is positioning the new Iconia A1 as a competitior to other budget Android tabs like the Tesco Hudl and Argos MyTablet. The tablet also features a 1.6GHz Intel Atom Clovertrail+ chip, 1GB of RAM, 16GB of internal storage and a microSD slot. It will arrive toting Android 4.2.1 Jelly Bean out of the box. "Consumers expect more than ever from value-oriented products, and the Acer Iconia A1-830 tablet delivers much more than tablets in this class with its vibrant IPS display, premium aluminium metal finish and great performance and sound," said Jerry Kao, Acer's AVP of its mobile consumer business. Meanwhile, the updated Iconia B1 offers a smaller 7-inch display with a dual-core 1.3GHz processor and will set you back £107 for the privilige. The Taiwanese company hasn't made much of an impact with its smartphone offerings thus far, but looks to be offering a sound mid-level Android handset in the form of the Liquid Z5. It boasts a 5-inch screen with the same 1.3GHz processor as the Iconia B1 along with 4GB of internal storage space. It also offers a 5MP rear-facing camera and favourable dimensions at 8.8mm thick and weighing 147g. Lastly, Acer will be refreshing the touchscreen C720p Chromebook with a new colour: the ethereal "Moonstone White" option.